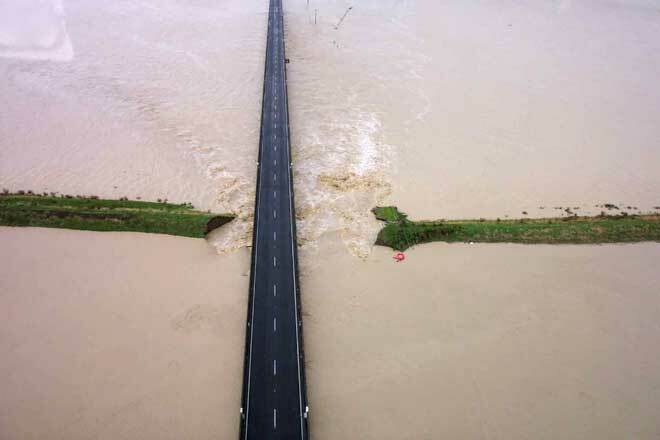 Swift-moving flood waters overwhelmed bridges and stopbanks across the Manawatū region during the February 2004 floods. This dramatic photograph taken at Whirikino, south of Foxton, shows the Manawatū River sweeping over a broken stopbank. At this stage the level was so high that there was bound to be an overflow somewhere. However, the road remained above the water level.